On Thursday, Ryan, who usually finds ways to needle the Pats, joked about what it would be like to coach Tom Brady. 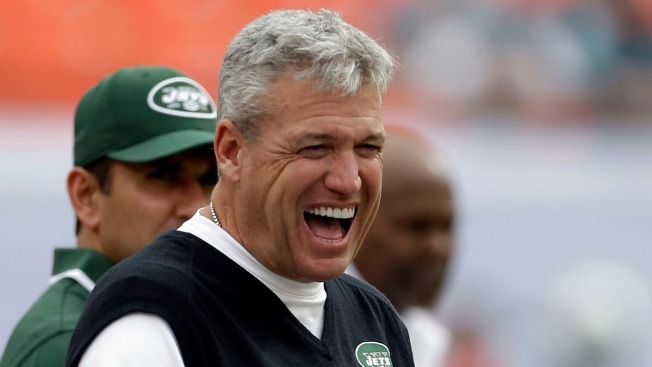 It looks like Rex Ryan will be making jokes right up to the end. The Jets coach will almost certainly be fired in the coming weeks, but he'll face his long-time nemesis, Tom Brady and the New England Patriots, (likely for the last time, at least as the Jets coach) on Sunday. "No, I don't marvel at (New England's success this century). I think Brady is a huge reason for it," he said, via ESPN.com. "But the Patriot Way and all that stuff, obviously it works. My brother [Rob] was there for two Super Bowls. It's obviously a very successful system. I think having that consistency at that position in particular -- the quarterback position -- probably makes it a little easier than maybe other teams have gone through." Ryan arrived in New York before the 2009 season and led the Jets to back-to-back AFC Championship games but never made it to the Super Bowl. Things began to crumble in 2011, Tim Tebow arrived in 2012, and by 2013, this was Geno Smith's team. With two games left on the 2014 schedule, the Jets are 3-10. A division without Brady would have made Ryan's life infinitely easier. "I was hoping he'd retire like four or five years ago, but that didn't happen," he joked. "Now he's talking about playing his whole life. Oh, boy." When asked what he'd do with a quarterback like Brady, Ryan responded, "I'd do like anybody else would do. My wife could coach him ... Nah, I'm just kidding." After years of poking the proverbial bear that is the Patriots, maybe Ryan's now trying the "more flies with honey" approach to pre-game Jedi mind tricks. Hey, at this stage of the proceedings, it can't hurt to try.